To VBA change cursor in an application, you have the Application.Cursor property. To see them all, go to the View menu in the VBA IDE (VBA Editor) and click on Object Browser. 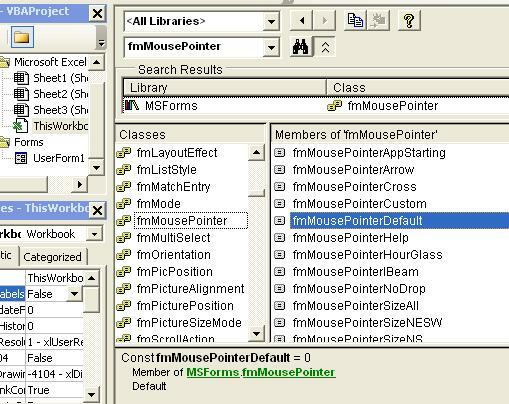 Then, type fmMousePointer in the find box and click on the binoculars as in the figure below. When you click on each cursor, you can see its numerical value at the bottom of the list. In the image, you can see that the numerical value of the default cursor is 0. you can use the numerical value instead of the keyword in your code if you please.